Saddam Hussein is gone. He got his, the just deserts for 30 years of brutality and tyranny, violence and oppression unleashed against his own people and anyone else within reach. By this point, everyone knows the big irony: The tyrant brought low by us, the nation that once upon a time saw fit to encourage his designs–as long as those designs injured a common enemy and didn’t rebound against us. Ancient history. And now, the morbid fascination of Saddam’s departure. The New York Times says that part of the pre-hanging procedure involved preparing a “red card” to inform the condemned man he was about to be executed. The red card is part of the vengeance exacted on Saddam, as his regime reportedly invented the practice of presenting the notices to the thousands it condemned to death. So Saddam hangs. Surely, there’s some kind of justice in that–even if only the score-settling kind that Iraqi Shiites and others Saddam suppressed will savor. But after Saddam? It’s difficult to believe his execution matters much in a large sense; that it will end extinguish a dire threat to the world or bring peace or freedom to Iraq or do much to assuage the victims of his crimes. And his crimes: Beyond ruling by fear and murder, he launched wars that visited untold suffering on people inside and outside Iraq. He aspired to the part of regional power broker, and player on the world stage, and in a sense got his wish. He became our president’s Public Enemy No. 1, and Bush is said to have the pistol Saddam was carrying when he was captured, mounted and on display in his private White House office. And look at the headlines now: Not just any two-bit gangster gets this kind of attention when he takes a fall. “… The other terror that scares us from self-trust is our consistency; a reverence for our past act or word, because the eyes of others have no other data for computing our orbit than our past acts, and we are loath to disappoint them. “But why should you keep your head over your shoulder? Why drag about this corpse of your memory, lest you contradict somewhat you have stated in this or that public place? Suppose you should contradict yourself; what then? It seems to be a rule of wisdom never to rely on your memory alone, scarcely even in acts of pure memory, but to bring the past for judgment into the thousand-eyed present, and live ever in a new day. In your metaphysics you have denied personality to the Deity: yet when the devout motions of the soul come, yield to them heart and life, though they should clothe God with shape and color. Leave your theory, as Joseph his coat in the hand of the harlot, and flee. “Speak what you think now in hard words, and to-morrow speak what to-morrow thinks in hard words again. …” That’s the tough part. An immature sharp-shinned hawk (or possibly an immature Cooper’s hawk; the bird references I’ve used, Petersen and Sibley, say they’re sometimes impossible to tell apart) in front of the neighbor’s house this morning. 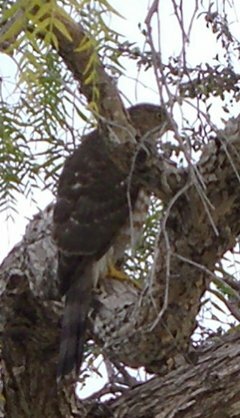 These hawks hunt other birds, but this one might have been angling for a squirrel meal; when we (the dog and I) surprised the bird, which was on the neighbor’s front fence, a squirrel scurried away from the same area. 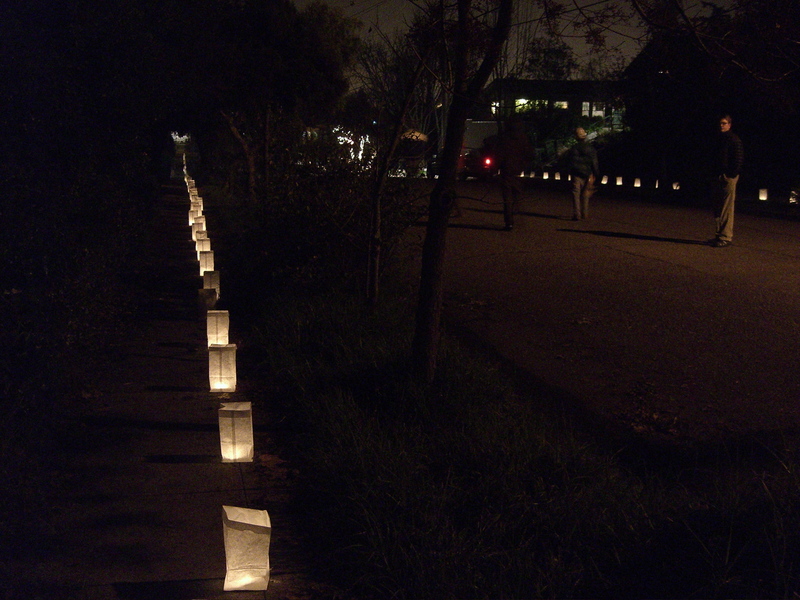 Here’s what it looked like last night on our street and some of the streets in our neighborhood. 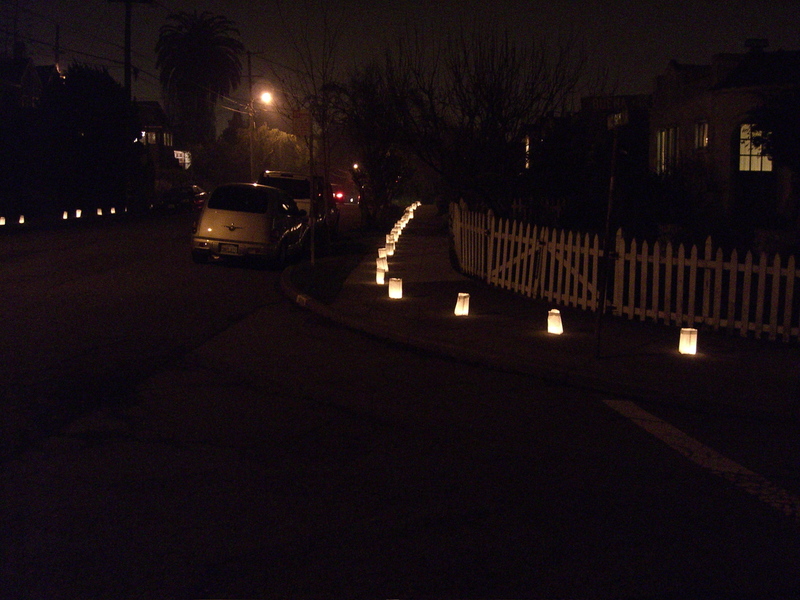 If you added up all the blocks that are putting out luminaria around us now, there are miles of streets lined with the lights. 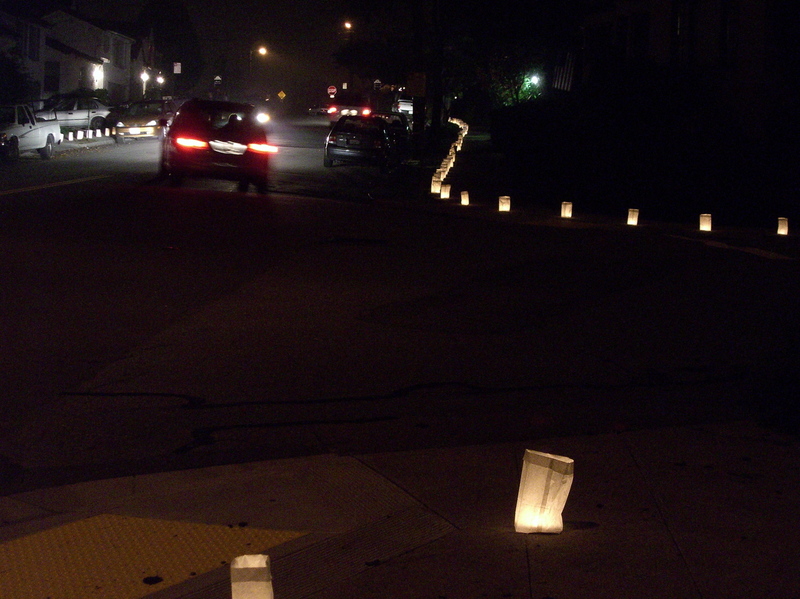 My impression from doing a late-night tour was that there was one major expansion–a one-third mile stretch of Curtis Street, to the west of us. Later, I’ll post a map of what we saw last night. 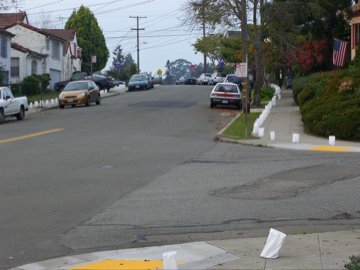 For now, here are some pictures I took on Holly Street and surrounding blocks. 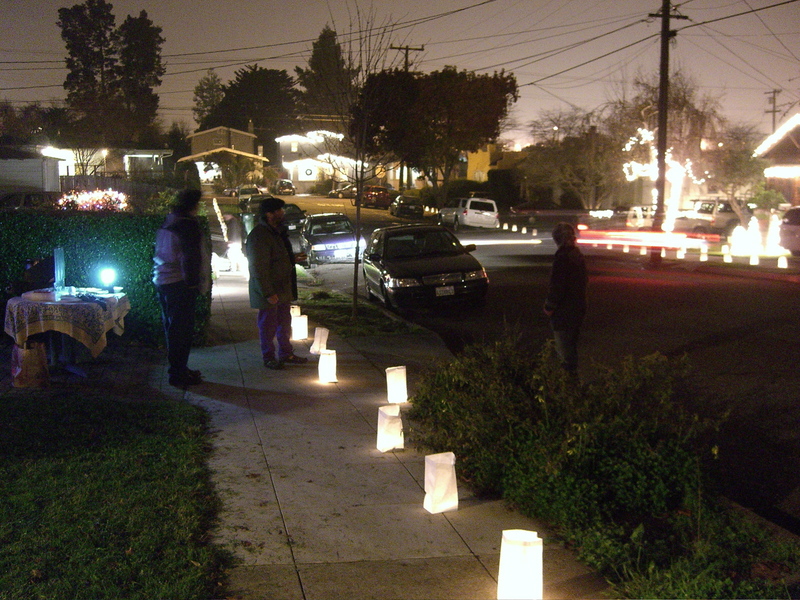 The epicenter of the neighborhood luminaria fest that started on Holly Street in the early ’90s has moved to the corner of California and Buena. A woman up there–Betsy, don’t know her last name–started organizing her block around ’98 or ’99. 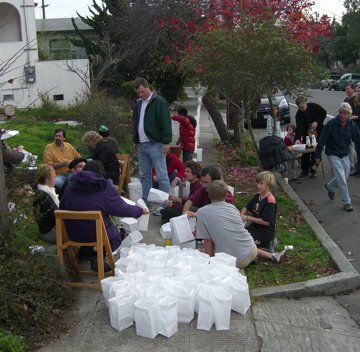 Other blocks followed, usually organized by people Betsy knows, until now there are 30 or 40 blocks involved. 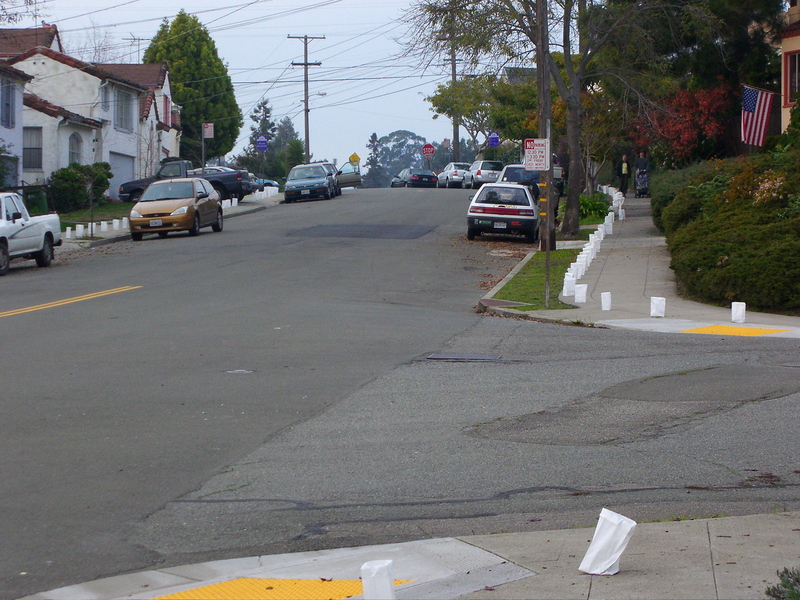 Anyway, the California Street tradition is a little different from ours just a block to the west. The folks get together in the mid-afternoon, fold bags and put them out on the street. 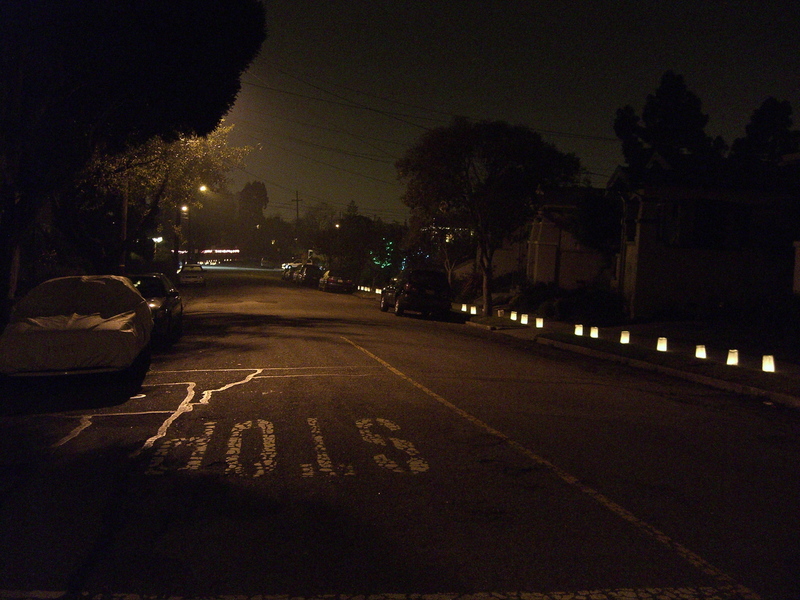 In fact, almost all the blocks except ours on Holly are done and ready to light by sundown. 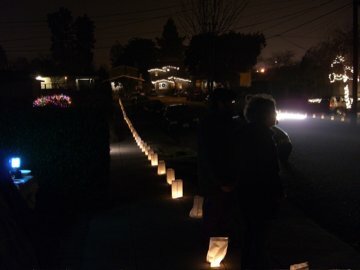 Last year, in fact, people were coming by our street and asking if we did the luminaria any more. Anyway–very cool to see the activity spread to all the places it has. 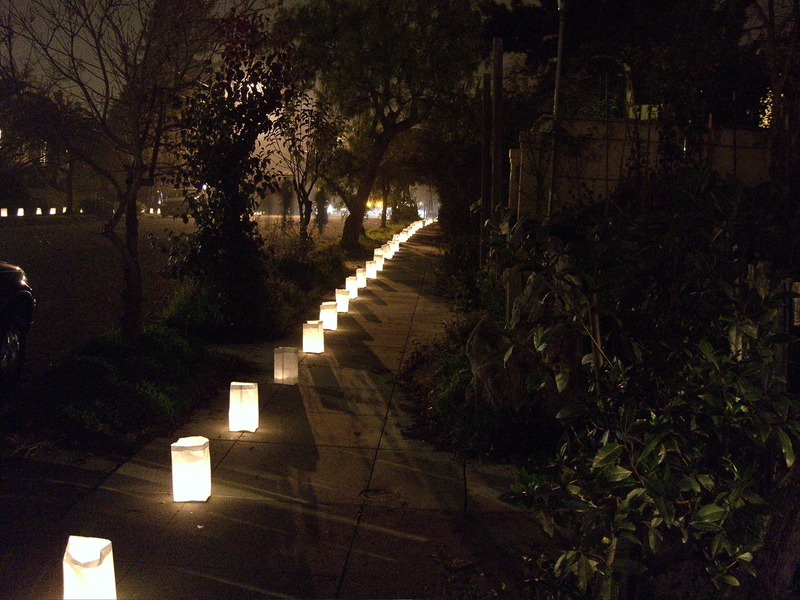 In Chavez Park at the Berkeley Marina earlier this month. It’s a big, hairy mushroom (this one was a good 8 inches tall). I had no idea what it was, but eventually got around to showing it to my mycologically inclined neighbor Jill. 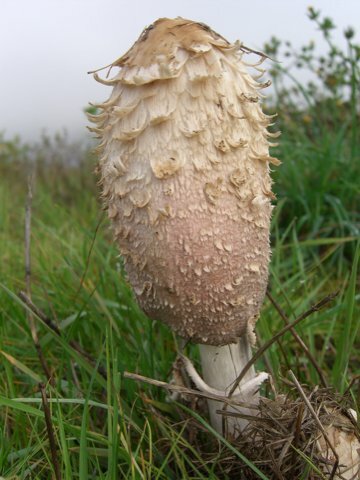 She immediately called it a “shaggy mane” (Coprinus comatus) ; it’s edible, and she and her family were going to go down to where I found it and look for more. 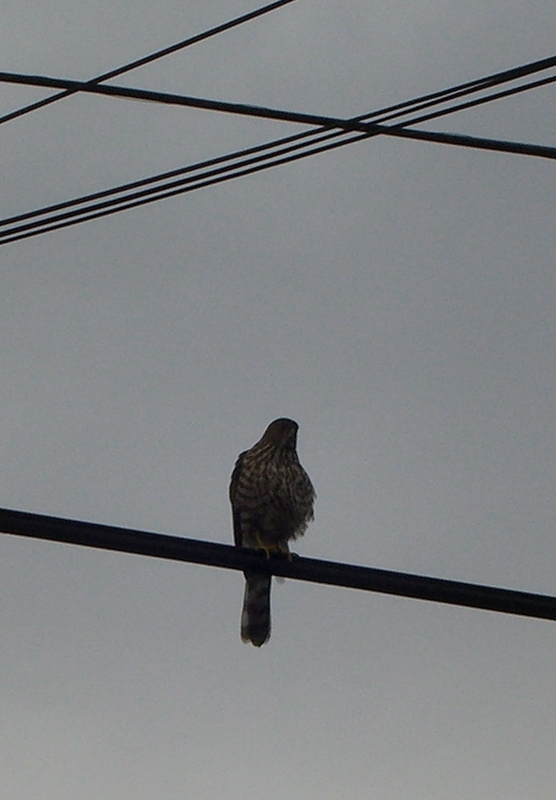 Another one, at 9:21 a.m. (nine minutes ago as I write this). 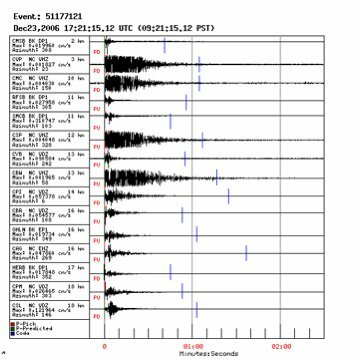 It was just a little shake; the earthquake authorities peg it as a 3.5, in just about the same place as the other two we’ve had since Wednesday evening–near the Claremont Hotel (I wonder how the shaking felt in that rambling old edifice). You don’t know when an earthquake is coming. You know they can be devastating, so they’re always in the back of your mind. Even if you go for months or years without feeling one, you know what it is as soon as it strikes. And especially if you haven’t felt one for awhile, three in less than three days makes you a little nervous. What am I missing here? Any ideas? These are as handsome an A and a B as you’re likely to find gracing a holiday lawn anywhere. 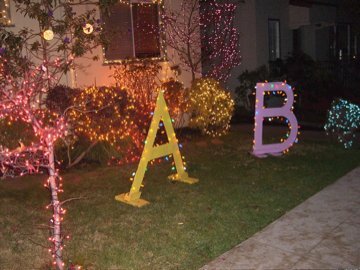 And maybe I should just embrace this display on that level. But I’m not getting the reference or the joke or whatever it is. I guess I’m going to have to knock on the front door and ask. 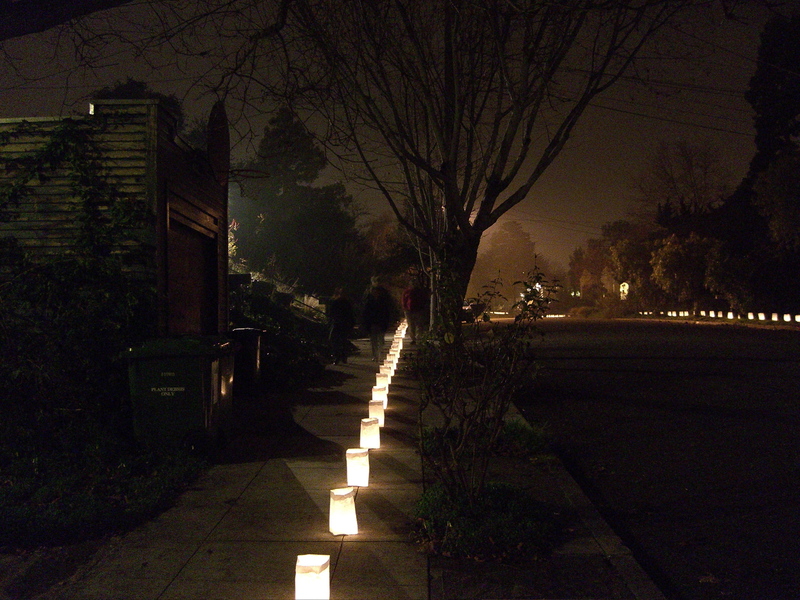 In other news, mere minutes (eight, exactly) after this exclusive picture was shot on Berkeley’s Monterey Avenue, the dog and I were walking down our street when the ground gave a little shudder and there was a deep, thundering noise; an earthquake, the first I recall hearing outside. Key stat for the event: Magnitude 3.68, epicenter about three miles to the south and east, in the hills on the Hayward Fault, up the street from the Claremont Hotel; there was a 2.2 aftershock about 20 minutes after the first jolt, just perceptible here. I’m sure the hotel guests had something to talk about (and this is the second temblor to hit up there in the last 51 hours; Wednesday evening, there was a 3.67 at virtually the same location).